Singer Jake Bannon says the band plan on recording the new album in May, eyeing a late October release. "We've been writing [the] album for a couple years and we've been taking our time with it,." he tells Noisecreep. "It feels like the time to release it. It's been long enough for us, the creative process has worked out well, and we all feel pretty comfortable about where things are at." 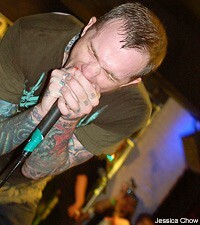 Converge will be playing two shows on May 1 in Chicago at Subterranean.